Lewis Hamilton - 'Hammertime' montage. Limited Edition print taken from the original pencil drawing. Hammertime is the end result of a long term project, the painstaking attention to detail that's been put into this piece of artwork is apparent when you take into account each section has had around 40 hours of work, except the 2 cars which are around 70 hours each. I wanted to display that man on a mission confidence in the centrepiece, the celebration of the champagne spray and in cockpit parc ferme, the poignance and humility of receiving his idol Ayrton Senna's helmet from the Senna family, and then I chose 2 cars from my favourites of his championship winning years. A Limited Edition of just 444 pieces worldwide, each print will be inspected, and individually signed and numbered, and will include a certificate of authenticity. Just £27.50 (plus £2.50 towards UK p&p per order / for overseas postage please enquire). All orders are despatched in a sturdy postal tube by tracked delivery. Based on the amount of interest in the piece even prior to completion, they are expected to sell out very quickly. 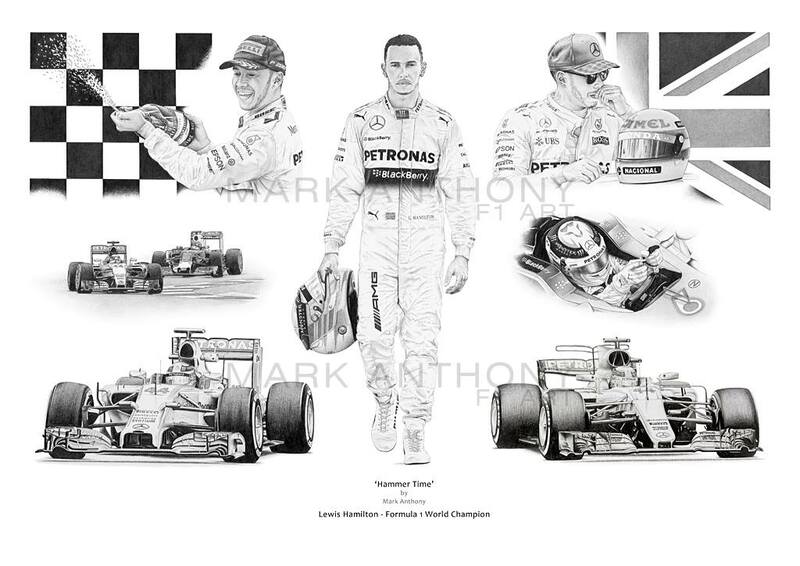 © Mark Anthony F1 Art, all rights reserved.